Hello friends! Today marks the beginning of a brand new color story at The Play Date Cafe and I just love how springy these colors feel! I always get a little nervous when I see purple since I really don't have many purple supplies but I'm always willing to give it a go even if all I have is a button or some twine. In this case, I wanted more and started digging around my stash. I was so happy to find the G45 "Place in Time" collection which has remained UNTOUCHED in the bag since I bought it last year. 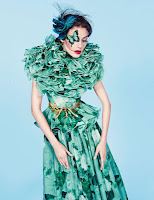 The first thing I saw were the chipboard flowers so I figured there was some purple paper in there somewhere, lol! 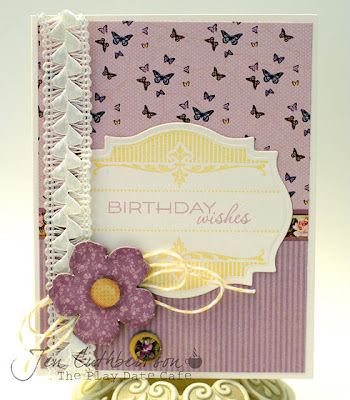 I found a sheet and cut it to size and then added a label I stamped in pale yellow with a plum sentiment and then added some trims to finish the card off. This will be for my step-mother's birthday in May! I hope she likes it! Thanks so much for visiting today and I sure hope you have time to play along! The winner will be getting a wonderful prize from our sponsor, Ribbons Unlimited! Hello friends! Today is release day at The Craft's Meow and I hope you've been enjoying the previews! I can't wait to see what you make with these wonderful new sets! If you're here from Jennie's blog, you're in the right spot. If not, head over to the TCM blog to get started! I started off using a pre-made kraft pillow box (though you can probably find a template to make your own pretty easily online) and wrapped it with some wonderful purple baker's twine. I stamped the label image and the sentiment from "Sweet Silhouettes" onto some white cardstock and cut it out using the labels 10 die. 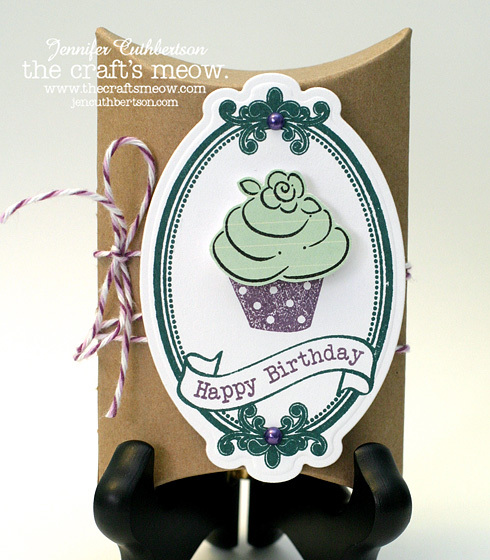 I stamped the cupcake base from "Sweet Birthday" in purple into the center of the label and then stamped the frosting onto a sheet of light green patterned paper and popped it off of the label using foam squares. I finished the label with a couple of pretty purple pearls. 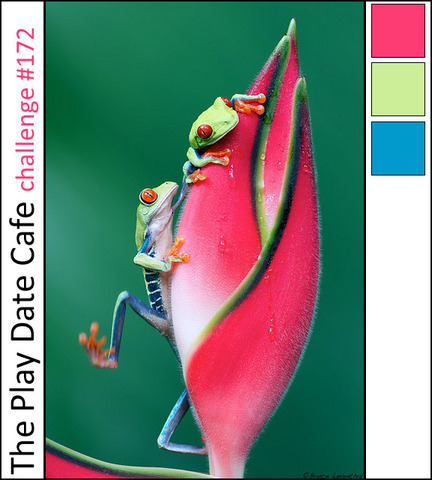 In case you hadn't noticed, the color combination was inspired by this week's color story at The Play Date Cafe where TCM is the sponsor this week! 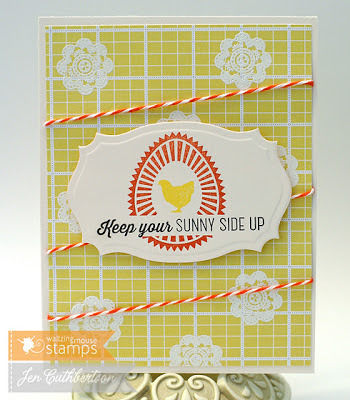 Head over there to see all of the colorful inspiration by the rest of the DT using stamps from TCM! Thanks so much for visiting today and next up is Jessica! Hello friends! 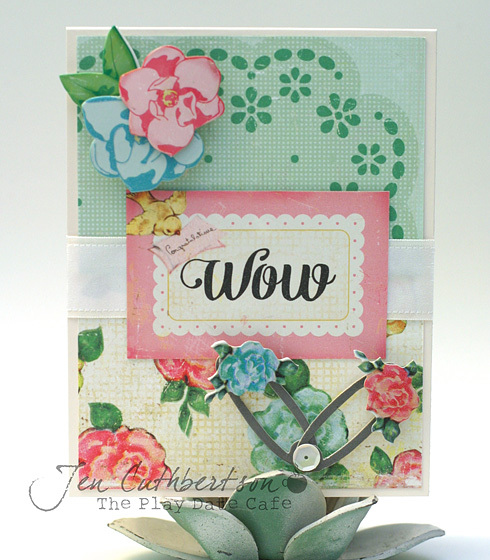 Today I have a "just for fun" card that I made using some of the wonderful new papers I got from Glitz! I've been refactoring my RSS feeds now that the Google reader is going away and trying to get them organized and readable again. I can't blame Google entirely for why I've been AWOL from so much lately (more on that later) but I'd really like to get back into some challenges I miss and more creating. For this card, I was inspired by two photos. 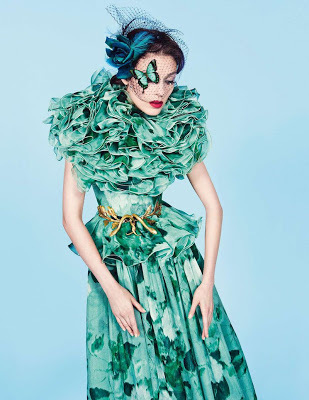 This wonderful aqua, ruffled dress from the Tuesday Trigger inspired my color palette as well as the ruffled look of the ocean waves the little boat is sailing on. 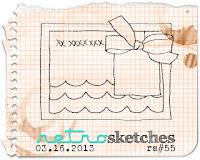 And the Retro Sketch was the inspiration for my layout. I started out with a couple of paper layers from the Uncharted collection and then cut my little boat and sail freehand from some papers from the collection, popping the sail up a bit for some dimension. I finished the card with a splash of color from some washi tape and used a giant rhinestone as a little sun. This card is going in my stash for my hubby for a "just because" occasion. Hello friends! 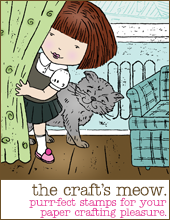 Today is the fourth day of previews for the March release at The Craft's Meow! I've been loving all of the inspiration from my fellow designers and sure hope you are, too! Today we are showcasing a wonderful set, "Sweet Silhouette", designed by Nina B! This set has a number of wonderful silhouettes, a frame that coordinates with Spellbinders Labels 10 dies, and a number of coordinating sentiments! This set won't be on sale tomorrow as it is the gift with purchase set! Yeppers, yours free with a $50 purchase! I just got a box full of new goodies and decided to use my new Dear Lizzy papers for this card. I started off by layering two papers onto a cream linen card base and then took a coordinating tag from the collection and stamped it with the frame, one of the silhouettes and one of the sentiment from the set. I finished the card with some beautiful trim and two, tiny rosettes. Thanks so much for visiting today! And, don't forget to head over to the TCM blog and leave a comment for a chance to win this set for yourself! Hello friends and welcome to day three of the big 2nd birthday bash at The Craft's Meow! 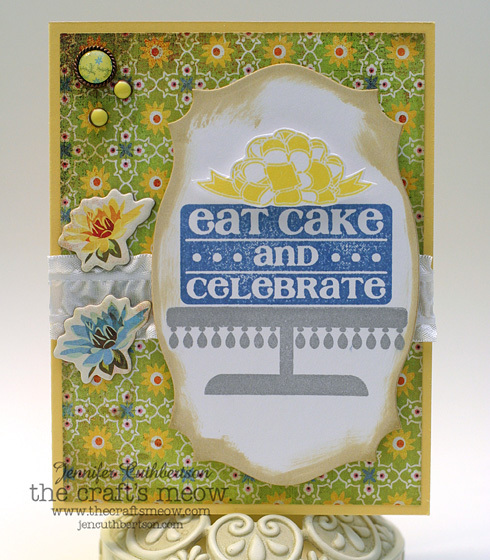 Today we are showcasing a wonderful new set by Nina B called "Take the Cake!" This is a wonderful set with so many cake layers and wonderful sentiments, you can build any cake you'd like to! I decided to build my cake on a die cut of a #25 label from Spellbinders and used the blue and yellow of the backing papers as my inspiration. I stamped the little cake stand using silver ink and popped the little bow up using foam squares. I finished the card with some embellishments and some ruffle ribbon. Thanks so much for stopping by today and don't forget that two lucky winners will be able to take this set home absolutely free! Head over to the TCM blog and leave a comment - it's that simple! Hello friends! I'm so glad you could make it by for the second day of previews for the March release at The Craft's Meow! Today we are showcasing "Sweet Birthday" designed by Mabelle R-O! This set is chock full of birthday images and a number of wonderful sentiments! I know you will love it! Thanks for visiting today and don't forget, there will be two winners of this set as part of the big 2nd birthday celebration! 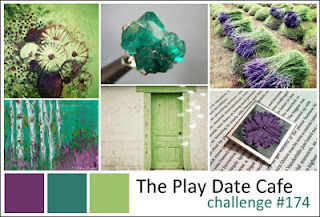 Head over to the TCM blog and leave a comment to be eligible! The theme of the party this month is "luck" and I couldn't very well not use green on St. Patrick's Day, could I? 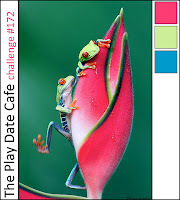 So, even if my card isn't St. Patty's themed, it is still in the color of the day! I've been on a holding pattern with getting new supplies lately simply because I have SO MUCH stuff already and still haven't unpacked it from the move. I sometimes wonder whether we are the laziest movers on the planet because we have a ton of unopened boxes - mostly our books and our hobby supplies (Glen is a musician and I think most of his guitars and keyboards still haven't seen the light of day since October! Anyway, I finally ordered some new things that debuted during winter CHA and thought this new Dear Lizzy line (aptly named Lucky Charm) was springy and pretty and perfect for this project. I started off with two of the coordinating patterned papers that I stuck together with a nice, thick piece of washi tape, added a die cut jar from the collection, and then stamped the gorgeous Labels 18 image in pale yellow and a sentiment from Compact Sentiments II. I finished the card with some pink flowers. Hello friends! Today is a special day - day one previews for the March release at The Craft's Meow! Why is it special, you ask? 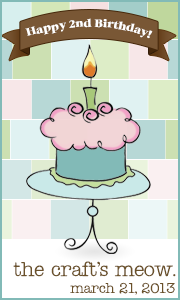 Well, it is TCM's 2nd birthday bash! Today the DT is showcasing a fun birthday set, "Birthday Pun", designed by Karen Baker! 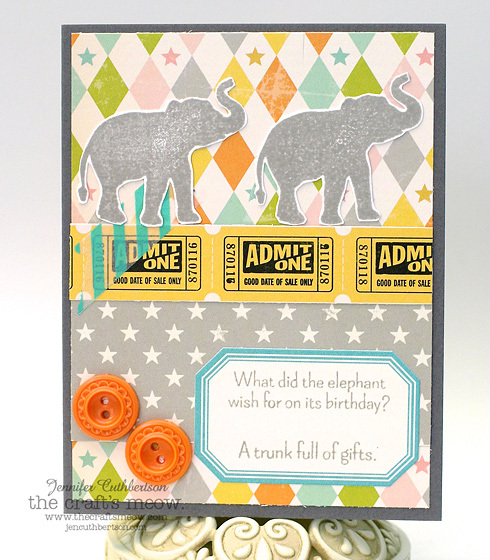 This set has a number of fun animal silhouettes and matching sentiments! I started off with some fun, carnival-themed papers and layered a few on a gray card base and added a strip of washi tape on a lark. I used a coordinating label sticker and stamped it with the punny sentiment. I stamped the elephant image from the set twice, cut it out, and added them to the card. I finished with a couple of orange buttons. Thanks so much for visiting today and as part of the big birthday celebration, there will be two winners for this stamp set! Head over to the TCM blog and leave a comment to be eligible! 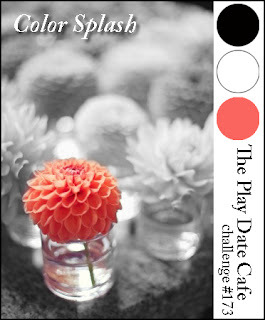 Hello friends, today is reveal day at The Play Date Cafe and I just adore this week's color splash! Coral is one of my favorite colors and I think it pairs perfectly with black and white!! I've had my eye on my older OA Midway collection for a while and found the coral accents perfect for this challenge so I started off with a striped background and cut out some apart some pics from the photo booth sheet and added a strip of tickets to the left edge. I then dressed up the "photos" with some chipboard accents that I sprayed with some Mister Huey. I finished the card with a button and a sticker from the collection. Thanks so much for visiting today and I can't wait to see what you create with this gorgeous splash! Hello friends! Today is release day at Waltzingmouse Stamps and there are three wonderful new sets that are now available for purchase - "A Good Egg", "Folk Art Labels 25", and "Folk Art Medallion." I hope you've enjoyed the previews this week and I just know you will love seeing the sets in their entirety! I chose to use "A Good Egg" for my hop project - it is just so cute and I really haven't gotten enough Easter projects out of my system yet! :) I started with a pre-made kraft favor box and stamped the banner sentiment from the set onto a #25 label that I cut previously. I added the little chicks and the bunny to the label and secured it to the top of the box with some double-sided tape and some twine. I stamped one of the eggs from the set onto four sheets of coordinating paper, cut them out, and adhered them to each side of the box. I finished filling the box with some paper Easter grass and some colorful candy eggs! This project is perfect for multiples and would make great treats for kids! Thank you so much for visiting today and I can't wait to see what you make with these wonderful stamps! This is my third (!) post of the day. 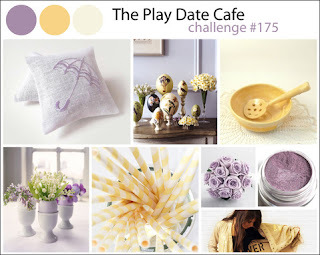 If you're looking for The Craft's Meow blog hop or The Play Date Cafe reveal, please scroll down. For my first project, I started off with a kraft gift bag (I had to cut the photo down so you could see some of the detail) and stamped the large medallion right in the center. I then filled the spaces in the medallion by stamping some of the little "builder" florarl motifs in the set in red, olive, and kraft ink. 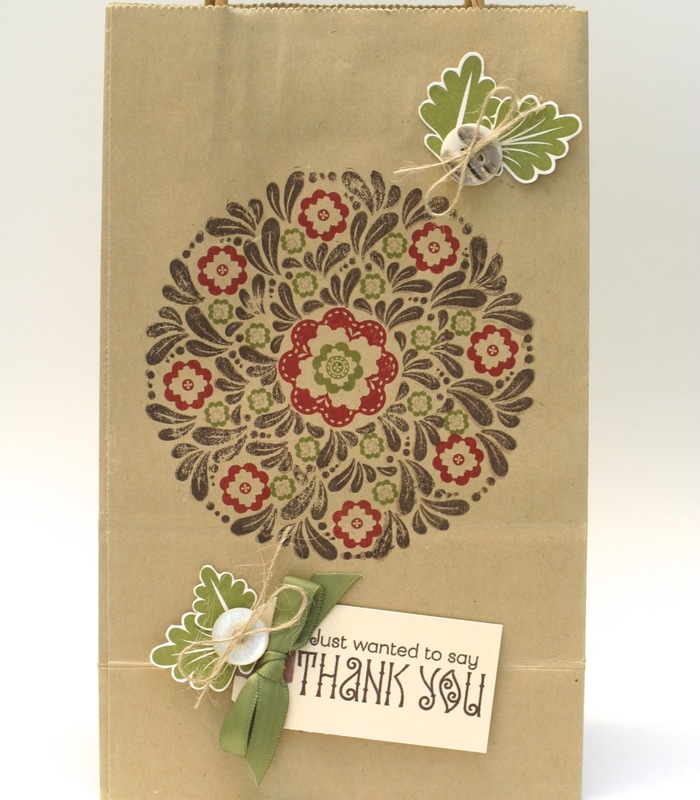 I finished the bag with some of the leaves from the set and a tag stamped with one of the sentiments. 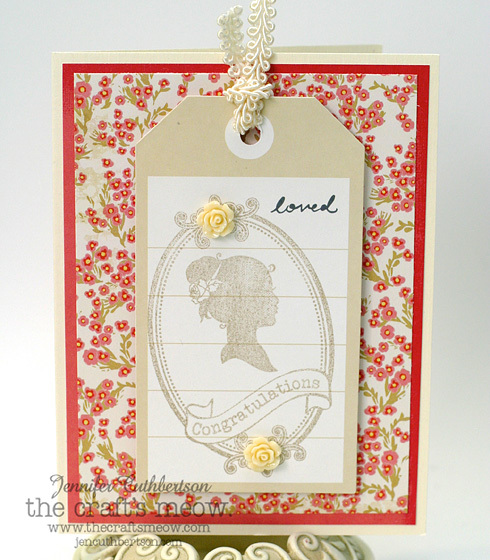 For my second project, I decided to use the floral spray image and stamped it twice in the center of the card. I then used builder images from the set to flesh out the rest of the card and finished it with a sentiment from the set on the lower right. I am absolutely in love with the font in this set and will use it often! I had so much fun building the medallion and the card and I know you will too! This set is so versatile and the possibilities are really just endless! Thanks for visiting today! The Craft's Meow - March Blog Hop! Hello friends! 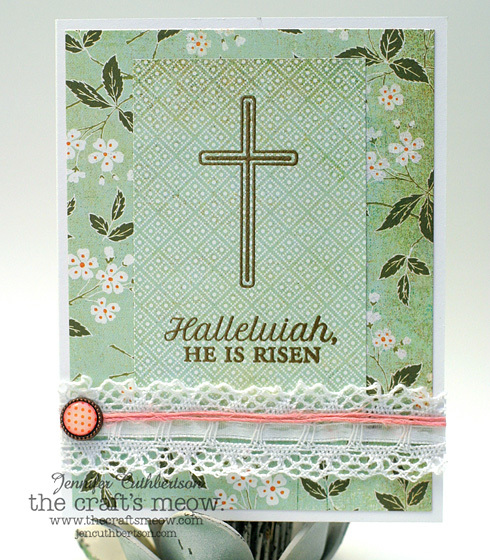 Today is blog hop day with The Craft's Meow and the DT is showcasing Easter/Encouragement cards! There are so many wonderful TCM sets that would be perfect for these occasions! If you're here from Jennie's blog, you're in the right spot. If not, head over to the TCM blog to get started! For my project, I decided to use Easter Blessings and God's Blessings on this Easer card. I took two panels of coordinating paper that reminded me of Easter and springtime and stamped the small panel with the cross and the sentiment and then embossed them with gold powder. I finished the card with some crochet trim, some twine, and a coordinating brad. Off you go to Jessica's blog for more inspiration. Thanks for visiting today! Hello friends! I hope wherever you are, you've been getting a bit of spring weather! It did rain last night (we need it soooo badly so it was welcome), but for the past week, the weather has been wonderful here and has inspired us to get in the garden and start doing some yard planning! Since we moved into our home in late September last year, we saw the tail end of the flowers in our yard but is has been very fun to see all of the spring flowers and shrubs starting to bloom! There's color everywhere! Speaking of color, how about these wonderful colors for this week's color story at The Play Date Cafe? Hollyhock, Spring Bud, Azure sure say spring to me! Thanks so much for visiting today and don't forget to link up by Tuesday for a chance at a wonderful prize! Hello friends! Today is day two of the March release for Waltzingmouse Stamps! Yay! 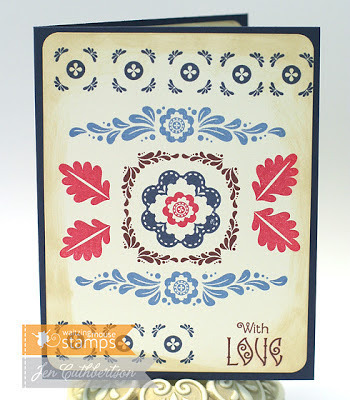 Today we are previewing "Folk Art Lables" which is a small but impactful set that you will just love. Oh, one other tiny detail - the label coordinates with the Labels 25 die from Spellbinders! For my first project, I went with some folksy themed papers and layered a couple on a white card base. I stamped the label in pink and one of the sentiments from the set in blue to coordinate with the colors in the papers and then finished the card with some crochet trim, a bit of twine, and a few sequins. I just adore this little set! 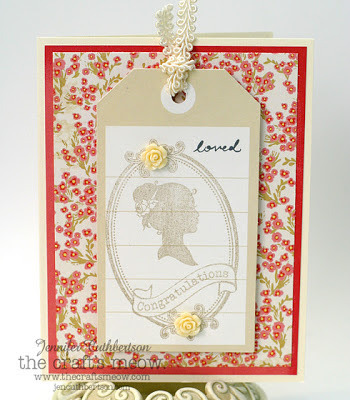 That label is beautifully drawn and the font for the sentiments is wonderful! Luckily you'll see more of this font if you stop by for tomorrow's previews! :) Thanks for visiting today! Hello friends! 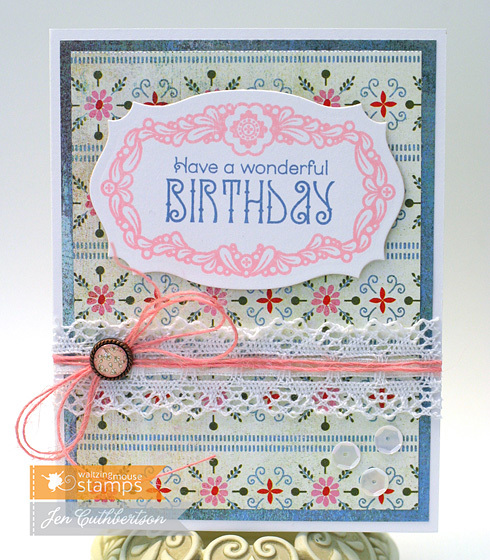 Today is a special day for me - day one of my first release as a full-fledged Waltzingmouse Stamps DT member! Yay! I've been such a fan of these wonderful stamps for so long, I am absolutely giddy to share these previews with you! Today we are previewing "A Good Egg" which is fun for Easter but so much more! There are wonderful sentiments and pattern builders in this set along with some of the cutest little spring characters you'd ever want to see! 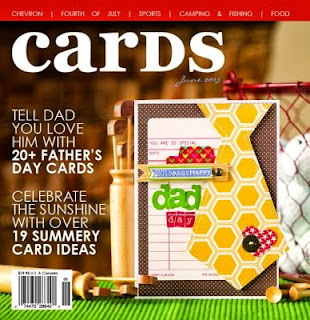 For my first card, I started off with some sunny, yellow grid paper which I stamped with a floral motif from the set and then embossed with some white embossing powder. I stamped one of the eggs from the set along with a little rooster and the cute sentiment on a #25 label. I wrapped the panel with some baker's twine to finish the card off. I think this is a perfect little encouragement card! 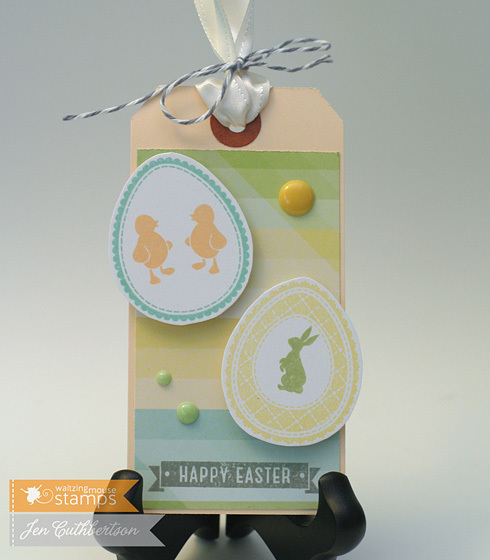 For my second project, I decided to make an Easter tag! 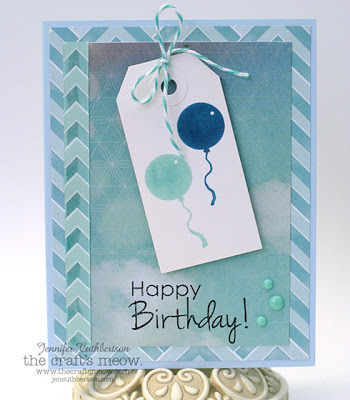 I started off with a large shipping tag and covered it with some patterned paper that I stamped with one of the little banner sentiments from the set. I stamped two of the eggs from the set and added some chicks to one and a bunny to the other. I finished the tag with some plastic dots and some baker's twine. Thanks so much for visiting today and I sure hope you'll stop by tomorrow for more sneaks!